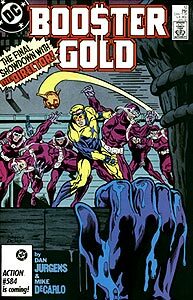 Cover Description: While Booster Gold and Skeets are in a fistfight with 7 purple-suited frogmen on a dock, a blue hand emerges from the water in the foreground. Brief Synopsis: Booster saves Trixie and Sarah on his way to a showdown with the Director, destroying the 1000's latest headquarters, Skeets, and his costume in the process. Issue Notes: This is the first issue to feature Booster's star as solid blue throughout the entire issue, establishing the standard for year to come. FASHION ALERT: This is the first time that the star on Booster's chest has been shown colored solid blue. Several protesters at the remains of the Reilleau Towers hold signs that read "No More Heroes" and chant "No More Super-Heroes." While this could simply be a reaction to the destruction of the building, it is more likely a result of the events in the Legends mini-series being published at the same time as this book. In that series, Apokolips overlord and general all around bad guy Darkseid sent his lieutenant Glorious Godfrey to hypnotize the people of America against the superheroes of the day. Again, Booster says "Shazam!" before telling Skeets that the U.S. President is considering outlawing super-heroes, an event that does indeed occur in the Legends mini-series (featuring Captain Marvel). Trixie sarcastically refers to two members of the 1000 as "Crockett and Tubbs." They were fictional police officers and the main characters on the television show Miami Vice. Trixie and Sarah have been issued standard secret-organization issue jumpsuits as prisoners of the 1000. These gray outfits apparently include Nike athletic shoes. The hugely popular Nike Air Jordan, released in 1985, helped the company surpass $1 billion in revenue in 1986. The second headquarters of the 1000 is located underneath a ware house named Millennium Shipping. This is fitting, as the word "millennium" means "1000 years." POWER UP: When Booster activates his goggles' infrared capabilities, they are colored red. Booster notices something amiss when Skeets develops a sarcastic sense of humor. Skeets has previously denied having any sense of humor, despite the occasionally appropriate witty observation. The Director calls the 1000's elite squad of frogmen the "Scuba Squad." No lie. Skeets attributes Booster's growing understanding of 20th century slang to the amount of television that Booster watches. This certainly correlates with the growing number of television references that Booster is gradually making. Sarah Davis asks Skeets if he is a "boy robot or a girl robot?" Skeets doesn't answer, so I guess we'll never know. POWER UP: Booster reveals that the Legion Flight Ring is controlled by will power. This makes it's functioning fundamentally no different from a Green Lantern power ring. BUSTER GOLD: On meeting Senator Ballard in the 1000 headquarters, Booster addresses him as "Senator Bedfellow," paying him back for all the times that he's called Booster "Buster." Of course, the old saying goes that "politics makes strange bedfellows," and Senator Ballard is defiantly not normal. Reprogrammed by Doctor Shocker, Skeets attacks Booster. 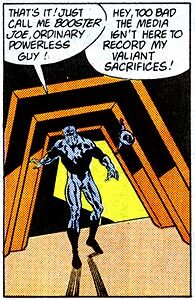 This despite the Director's claims that he was going to met Booster as "equals." After delivering the typical evil genius speech taunting the fallen hero, the Director points a revolver at Booster's head. The gun looks very much like a .38-calibre Smith & Wesson Military & Police revolver with a nickel or chrome finish. Vast numbers of variations on this model handgun have been in use around the globe since long before World War II. There's a bit of irony involved when a laser-toting 25th-century hero is threatened by a weapon in use for nearly a century. Skeets saves Booster by shooting the gun out of his hand, preventing the Director from shooting him in the head. This is the first time that Skeets has saved Booster's life. After breaking Booster's right arm, the Director reveals that his full title, so far as he has named himself, is the "Director of Death." Certainly, this sounds better than the "Director of Broken Arms." EXTRA, EXTRA: Booster appears on the cover of another newspaper (the Daily something), though only as a teaser for the next issue. As a result of the assault on the 1000's headquarters, Booster's costume has been reduced to rags and Skeets has bent fins and a broken visor. This is the first time that Booster's costume has been completely destroyed. It will not be the last. If there was previously any doubt, Dan Jurgens confirms in the letter column that, "Booster is DC's first post-Crisis character and was not involved in the Crisis or multi-verse in any way." Boosterrific Review: After quickly recapping the events that led to the current situation, Booster Gold runs the hero's gamut through the high-tech underground fun-house lair of a classic super villain. Booster faces everything one would expect from a cliched comic book criminal: legions of frogsuit-wearing henchmen, genetically modified guards, corridors of incredibly complex booby traps, and former allies turned traitor. While it sounds like a cliche, it reads like fun, thanks mainly to Dan Jurgens' pacing and, of course, Booster Gold's charm. A very solid end to a the first years' worth of Booster Gold stories. While I enjoyed his lengthy battle against the 1000, I was glad when it wrapped up. An interesting way to end the 1000 storyline and the interplay between Sarah and Trixie (and later Booster) was fun.